Secret Agent Cinder is a retelling of the Cinderella story, except not: though you dress up and dance with fancy people, it’s really about espionage and sneaking about at Versailles shortly before the French Revolution. It belongs to that small but growing category of Twine games — with Hallowmoor, Krypteia, and This Book is a Dungeon — that feature a world model and a map you can get to know. There are some light puzzles, and you can reach a sudden bad ending, though the game will then automatically restore you to the last reasonable checkpoint to replay. At the end, you get a rating for your stealthiness, revolutionary violence, and zeal. The result is short, polished, accessible, and quite a lot of fun. 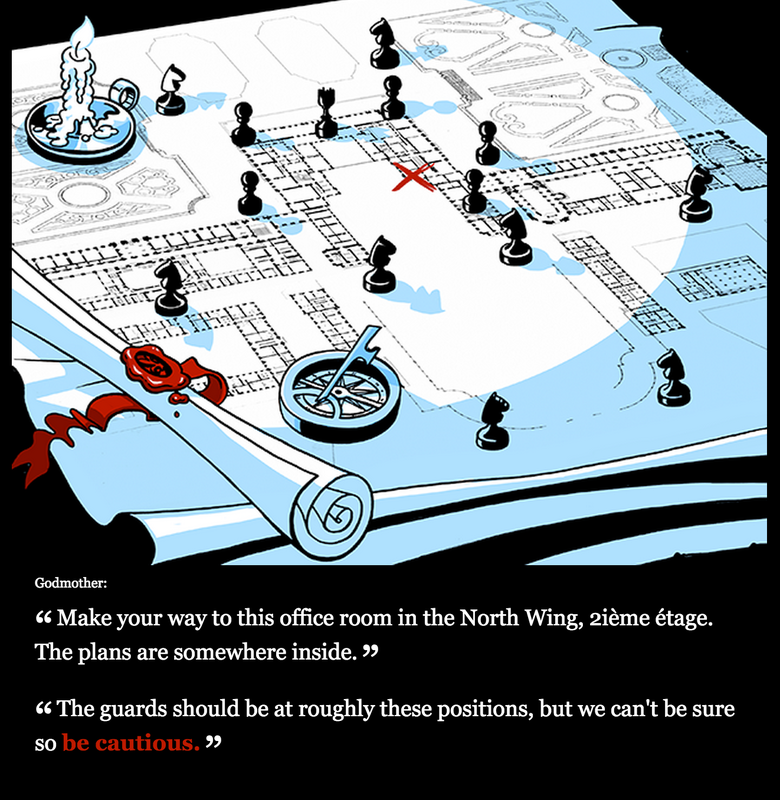 Besides having a map, Secret Agent Cinder uses illustration as a primary channel for storytelling: the pictures aren’t just a gloss on the text, but give key information about, say, the locations of guards. If you don’t pay attention to them, you’re likely to get caught. Many of the jokes are embedded in the imagery as well; it plays more like an interactive web comic than most things I can think of. Mildly spoilery discussion of the humor follows the break. Dagger hairpin or headdress incorporating a crowbar? And what 18th-century Q came up with the stabby fan, or the Ballgown Dentata? I want it all! 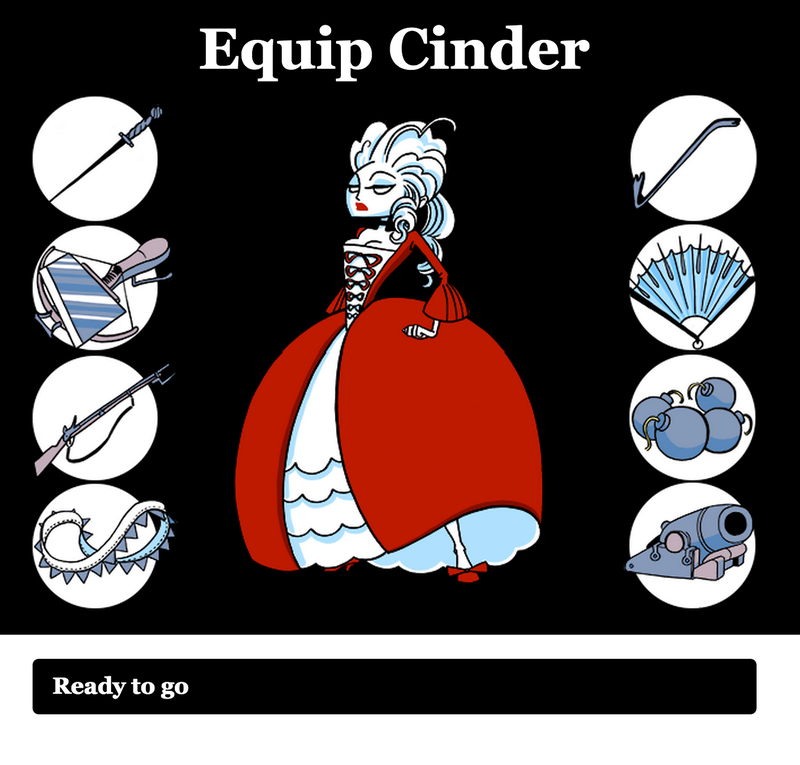 Cinder effectively has four inventory slots in her outfit, and the game dutifully implements all the juxtapositions, so you can dress her up in any combination you like. Except… your handler fairy godmother doesn’t want you to take any of that stuff in with you. In fact, you’ve been told ahead of time that you’re not supposed to take any weapons; you just forget/conveniently ignore that (or at least, I did) when presented with this wardrobe of goodies. So you dress her up, weighing your options. The crowbar in the headdress is less cute-looking than the dagger, but I’ve already got some sharp objects elsewhere, so maybe I’ll need the leverage? The bombs are a bit on the obvious side, but look how well they go with my skirt! Etc. But finally you settle on something… and fairy godmother refuses to let you proceed until you take it all off again. It’s classic participatory comedy that works in part by leveraging the player’s knowledge of game interfaces. Anyway, there are many other fun and surprising moments, but the game remains pretty compact and doesn’t wear out its welcome with all this. This entry was posted in CYOA, interactive comics, interactive fiction, Reviews, user interface by Emily Short. Bookmark the permalink. Is there any chance you’ll review Chris Martens’ Ceptre? I usually don’t review languages and systems unless I’ve had a chance to play with them at least a little. Is Ceptre open source? I think I’ve only seen papers about it, so far, but I might have missed something. …but that said, it’s a bare-bones modeling system right now, and in particular it doesn’t have any kind of natural language front-end (for parsing nor rendering). I wouldn’t expect an analysis of the system at this point to be terribly useful to this blog’s audience. That was a fun game! I wonder if it’s possible to get an ending other than the one where Cinder loses her shoe, though; I saw a note from the author somewhere that there’s another ending you can get if you do everything wrong, but I couldn’t find that one. I played twice and got different numbers of stars and violence ratings, but she lost her shoe both times.